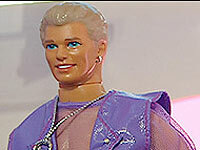 Well, now that Ken has gotten a Metrosexual Makeover it's clearly obvious that Barbie is NEVER going to get a committment from him. He'll probably be asking for alimony and taking her Corvette, becuase you know there's nothing more a "metrosexual" likes than a Pink Corvette. Actually, The Boys are all in a titter because now that they see the "new and improved" Ken they want to get a little piece of the action. I'm afraid though that Billy and Carlos may be "a little too big" for Ken, if you know what I mean! I f I had even twenty dollars I would so buy this guy for ya! I actually thought of that when i fist saw the revamp... and never got to it! I'm confused. Did I miss something? I don't like to assume...but which part are you confused about Kat? If it's about the boys I have a few pictures I may need to send you which will explain everything. lol, no I get that part. I'm a little confused about Ken. hehe. Well Kat, for the first time I think Ken is NOT confused about who he really is. Wow! Ken looks like he recently spent some time in Brazil getting to know some of the country's more specialised doctors! At least Barbie knows for sure now. Who knew about this skank? Where's your cell tower at?